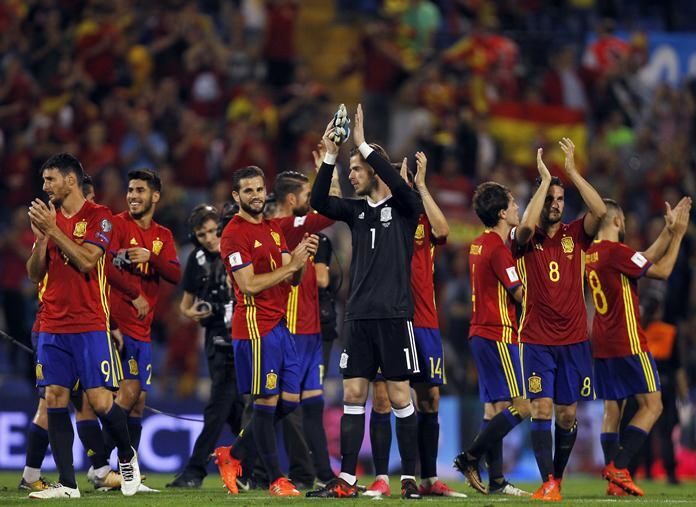 Alicante, Spain (AP) – Spain secured their 11th straight World Cup appearance aided by Italy’s home draw against Macedonia on Friday, while Serbia blew a chance to make it to next year’s finals in Russia after a loss at Austria. Spain comfortably defeated Albania 3-0 in a match in which defender Gerard Pique, an outspoken defender of Catalonia who had been harassed by Spanish fans during the week, received a mixed reaction from the home supporters. Italy practically secured a playoff spot but they were jeered by fans after drawing with Macedonia 1-1 in Turin. Even a victory would have kept the Italians in a difficult position to surpass Spain for first place in Group G because of a worse goal difference. Serbia needed a win against Austria to clinch their spot from Group D but lost 3-2 in Vienna, while Wales kept their chances alive by beating Georgia 1-0 despite Gareth Bale’s absence. Iceland stayed on the path to becoming the smallest nation to qualify for the World Cup after beating Turkey 3-0 in Group I. The group winners automatically qualify, while the best eight second-place finishers from the nine groups advance to the playoffs.